WINSTON-SALEM, N.C. (July 11, 2018) - The Winston-Salem Open will be one of seven tournaments throughout the summer to use game innovations announced today by the USTA, the ATP, and the WTA. The rule changes were the result of collaboration and consultation between all three organizations and are aimed at increasing the speed of play and creating consistency in time-related enforcement standards. Following the point, the score will be entered, the Chair Umpire will announce the score, and then start the 25 second-clock. If the player has not started the service motion at the completion of the 25-second countdown, the Chair Umpire will issue a time violation. The Chair Umpire will start the clock when the balls are all in place on the server’s end of the court. If the player has not started the service motion at the completion of the 25-second countdown, the Chair Umpire will issue a time violation. The Chair Umpire will have the ability and discretion to pause the clock. The Chair Umpire will have the ability to resume the clock from the same time or reset the clock to 25-seconds. Although the exact location has yet to be determined, a “clock” will be placed in a position visible to players, fans and the Chair Umpire. Along with the Winston-Salem Open, events in Washington D.C.; San Jose, CA; Montreal; Toronto; Cincinnati, OH; and New Haven, CT will also use these new rules, as will the US Open in New York, NY at the end of the summer. In 2017, the US Open utilized a Serve Clock and a Warm-Up Clock in the qualifying rounds, as well as the Junior Tournament, Wheelchair Competition, American College Invitational, and Champions Invitational. 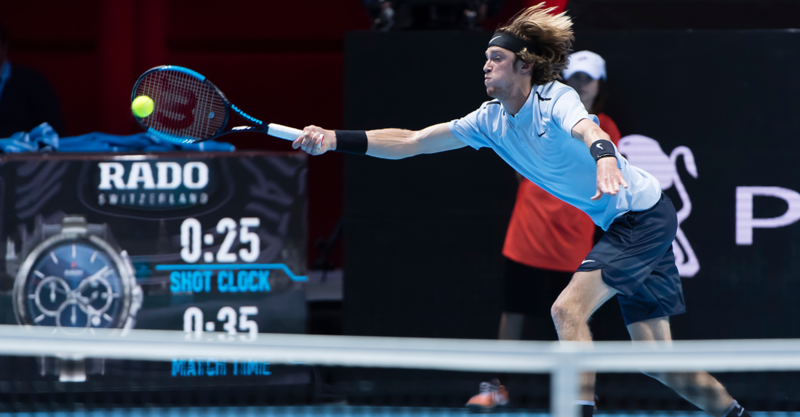 The ATP also featured a Shot Clock at the inaugural Next Gen Finals in Milan in 2017.